Happy Halloween! 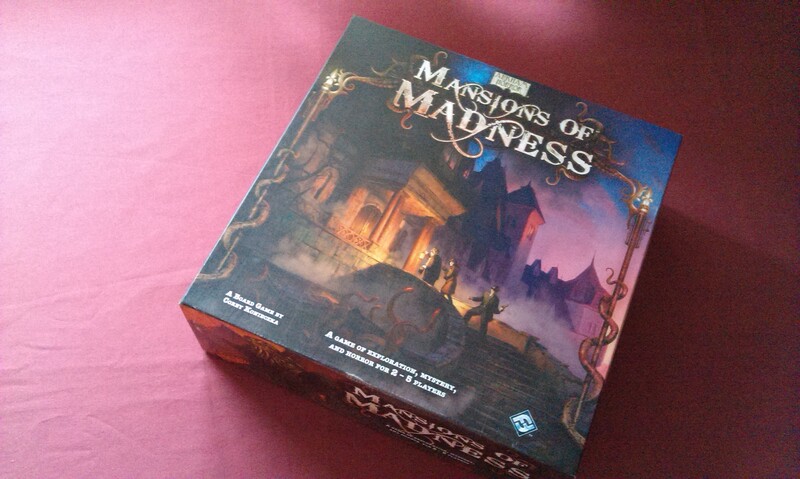 While I don’t really go in for all the spooky stuff personally, I always try to feature a thematic game here on my game day blog, and today’s offering is something I’ve been wanting to get round to for a long time – let’s enter the Mansions of Madness! (This blog is about 1st Edition, which is currently the only edition that I have played). Mansions of Madness is an utterly fantastic game. I need to tell you this right at the top, because this entire post will be coloured quite significantly by my love of this game. It was released back in 2011, I picked it up a year later, and had my first game with it around Christmastime. As usual, I played with my regular gaming buddy Tony, and we played through the first scenario, The Fall of House Lynch. While we were certainly enjoying playing the game, despite taking time to actually learn the ropes as we went, once the game was over we had a sort of joint moment of awe at what we’d just experienced. Despite the fact that this game took place almost five years ago now, I can still remember, quite vividly, both of us sort of leaning back from the table when it was over, and letting out a simultaneous “whoa” at how good this game is. Immersive just doesn’t seem to cover it. The game was spectacular – it was incredible, in the very truest sense of the word! Okay, so enough with the rhapsodizing, let’s take a look at the game. Mansions of Madness is a one-vs-many game that has its closest parallel (for me) in Descent, where one player takes on the role of the Keeper, while the rest of the group play as the standard stock of Arkham Investigators. The Keeper is an interesting role because, unlike the Overlord of Descent, he is part antagonist but also part DM, and I feel sometimes that people might miss the subtlety of this. Sure, as the Keeper you’re trying to defeat the Investigators, but there is a responsibility to ensure that the story that the game is trying to tell is told. If you play as the Keeper and sit there brooding evilly all game, then it’s not going to be a great experience. I’ve always played this game as the Keeper, so I guess I have more to say about this part than that of the Investigators. Let’s start with the board. 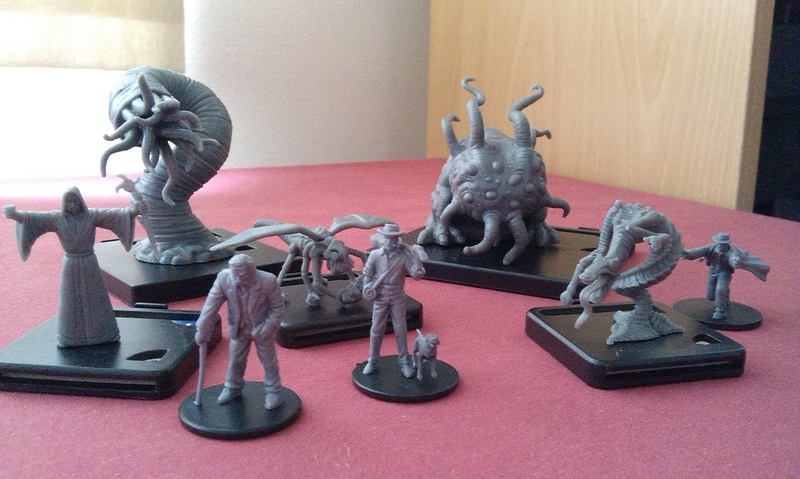 Mansions of Madness is a scenario-based game, and you get five of them in the core set. 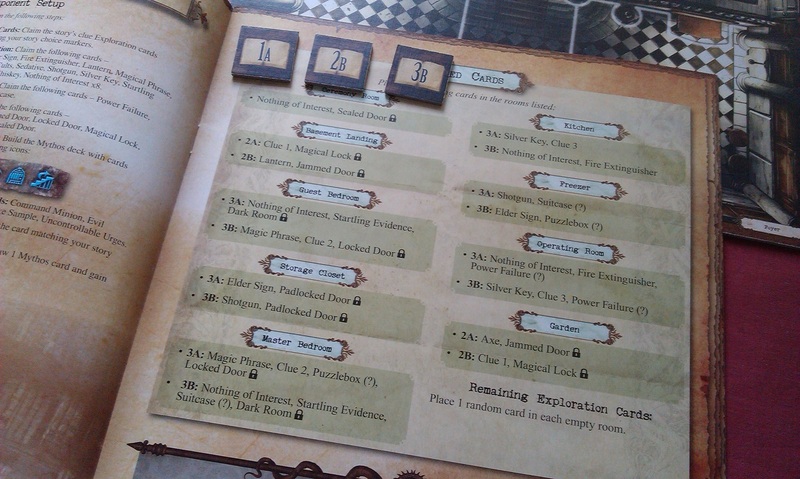 The board is modular depending on each scenario, with room tiles placed as shown in the set-up guide. It is then the Keeper’s responsibility to “seed” cards in the rooms according to his own set-up guide. Each scenario has up to six distinct parts where the Keeper can make a choice – does he pick choice A, B or C for part one? 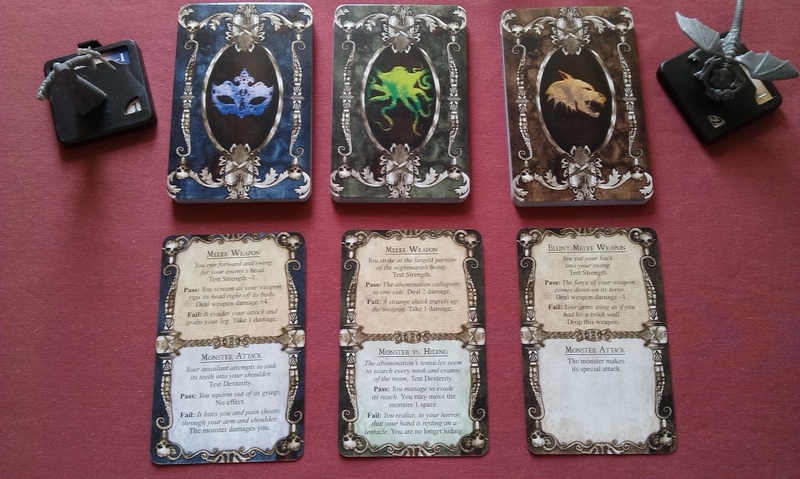 These story choices determine which Clue cards are seeded into the rooms. The rooms also include items that the Investigators can claim, but many also have traps or locks to overcome before they can be discovered. The set-up guide is crucial for ensuring the cards are placed so that they are encountered in the correct order – locks are no good on the bottom of the pile, after all! 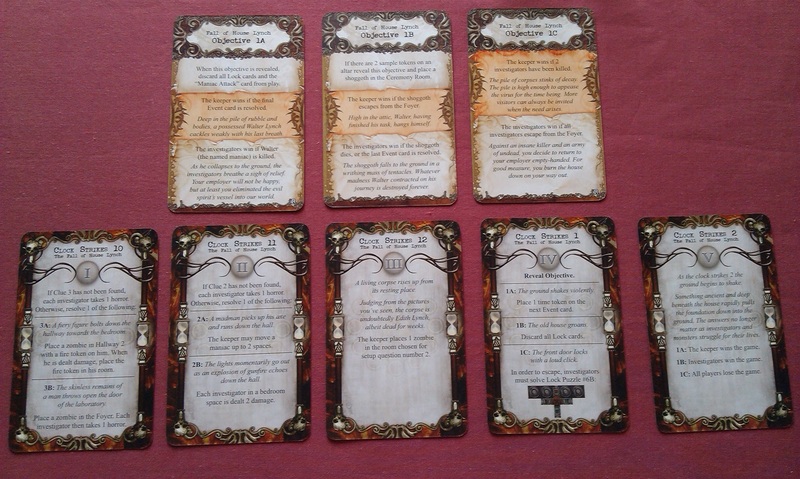 Once the cards are placed, the Investigators set about exploring the Mansion. 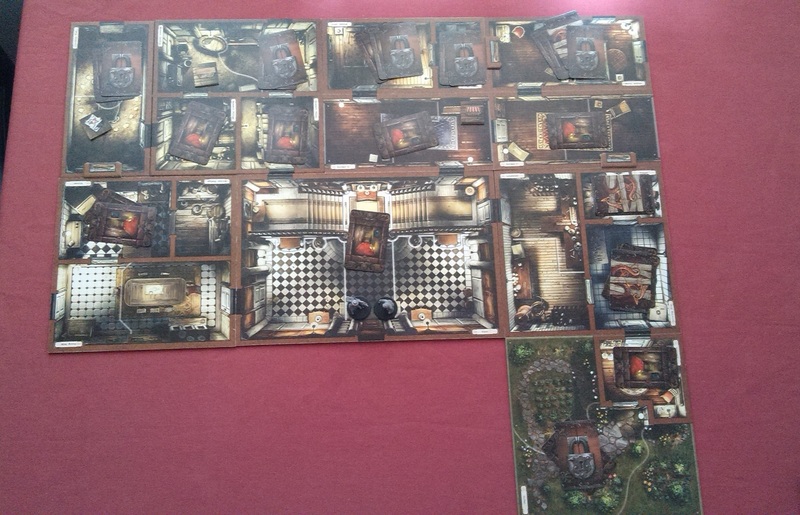 They’re trying to solve a mystery that is read out by the Keeper at the start of the game, and Mansions of Madness is one of the relatively few board games where flavour text simply must be read during the course of the game! It certainly helps with the theme, and relates to what I was talking about earlier, where the Keeper is part-DM in his role. The Investigators don’t actually get to know ahead of time what they need to do to win, so it’s critical to pay attention to the story, and not just charge about trying to gather up stuff. Though, like any good RPG, it’s always good to get stuff! 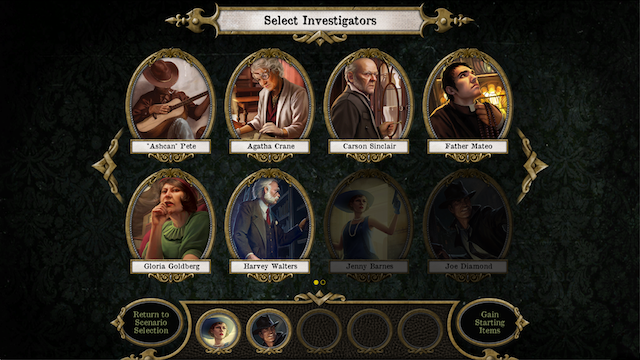 It’s really cool how the Investigators get to actually make real-time choices about what to do, based on the story being told, and not just some random whim. Something that really blew me away when I first played this game was the fact that the Investigators will often come across some locked item, either a door or a suitcase, and in order to overcome this obstacle, they need to solve a real, actual puzzle. Normally in these sorts of games, a player would just roll some dice and add a modifier to determine this, but no! There are a variety of different puzzles that you have to physically solve, such as the wiring puzzle shown above. Harvey Walters can have an Intellect of 7 (more on this shortly), meaning that he has up to 7 moves in this puzzle. Moves include rotating a piece 90º, swapping adjacent pieces, or removing a piece entirely and drawing a new one. In the above example, I actually managed it in 5 moves, which is fine for Harvey, but other characters might not fare so well! 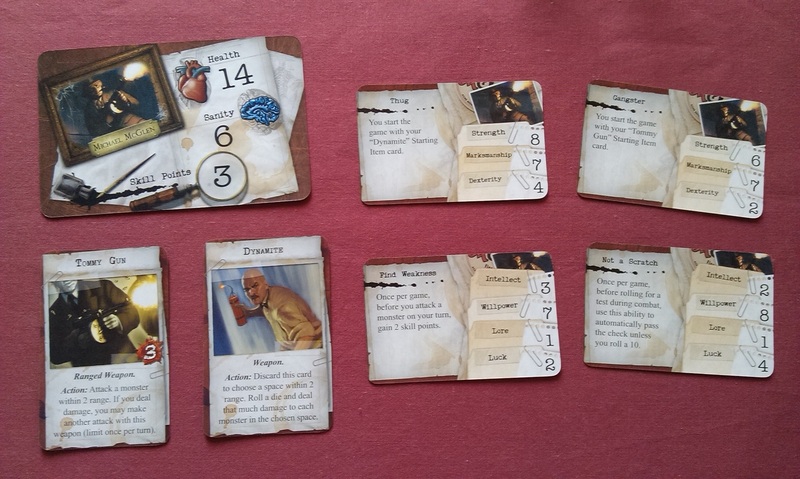 When you set up your Investigator character at the start of the game, you take the character’s card, then choose one of two Strength cards, and one of two Intellect cards, which give you the total stats for that character in the game. It’s an interesting way of mixing things up and, while you can’t alter your stats over the course of the game like Arkham Horror, it’s still a nice way of ensuring Investigators don’t always feel the same right out of the box. The Keeper can interact with the Investigators in a variety of ways, using a currency of threat points. Over the course of each round, the Keeper gets a number of threat counters equal to the number of players, and he can use these to pay the costs on a number of different cards, such as the Mythos cards or Action cards. These can be played to either slowly increase the madness, or to suddenly go all-out and really spring the traps of the mansion! Several of these cards do direct damage to the Investigators, and in true Arkham Horror-style, the Investigators can be both physically and mentally crippled over the course of the game. However, it’s not all shadowy-Keeper versus the Investigators, as there are a variety of monsters lurking in the dark places of the mansion, and the Keeper can use these to attack the Investigators head-on. Unlike in other Arkham-universe games, the monsters in Mansions of Madness are actual miniatures, though they also come with cardboard chits that slide into their bases for that classic Arkham Horror feel. So, rather than simply rolling dice and adding modifiers for strength, you determine what class of monster you’re attacking – humanoid (blue), beast (brown) or eldritch (green) and determine what weapon, if any, you’re using to go at it. You then draw cards from the appropriate deck until you find a card you can resolve – that is, a card that describes an attack with the type of weapon you’re using. There is still a dice element involved, as the cards will often ask you to test your Strength or something, but it’s overall a very different implementation of playing a board game. You’ll no doubt notice that the cards above are split in two – this is because the same cards are used if an Investigator attacks a monster, or a monster attacks an Investigator. In my experience, it can be quite common for these decks to cycle through at least a couple of times over the course of a game, though subsequent expansions brought out more of them to add some variety! In addition to all of this, there is also an Event deck going on irrespective of what both Keeper and Investigators are up to in the mansion. This Event deck consists of five cards, one of which is drawn after a set number of turns has elapsed, and its effects are resolved by the Keeper based on the story choices he made during the set-up. In the Fall of House Lynch scenario, the Objective card is revealed when the fourth event card is drawn, and this Objective then determines what happens. It’s an interesting way to keep something of a timer on the game, ensuring that you don’t end up just endlessly wandering about durdling, but in all of the games that I’ve played, I have never felt like these cards got in the way of the flow of the game. Indeed, the whole game in general just flows very smoothly. For sure, it flows much better if you have experienced players – particularly an experienced Keeper – but despite the weight of stuff in the core set box, it does actually feel quite streamlined and, dare I say, intuitive when you start playing. Don’t get me wrong, there are a bajillion moving parts in this game, and it can be something of a nightmare to deal with, but if you just sit back and immerse yourselves in the story, you will be rewarded beyond your imagination! I hear that Second Edition has streamlined the game somewhat, not least by relegating the role of Keeper to an app. I thought it surprising the new edition finally added actual new Investigators to the pool of Arkham Horror denizens – Agatha Crane, Carson Sinclair and Father Mateo join the ranks of Harvey Walters, Jenny Barnes and “Ashcan” Pete! I was initially dismayed to learn that the Keeper had been removed, and it strikes me that the app feels more like playing a video game than a tabletop board game. I haven’t actually purchased the new edition, but I’m nevertheless intrigued as to whether the new Investigators will make the shift into those Arkham games that I do follow! At any rate, I cannot recommend this game enough, certainly at this time of year!! Next Next post: Still Alive!